Lode Mill, a working, eighteenth-century water mill, is in the grounds of Anglesey Abbey, a Jacobean house near Cambridge which is built on the grounds of a medieval priory. 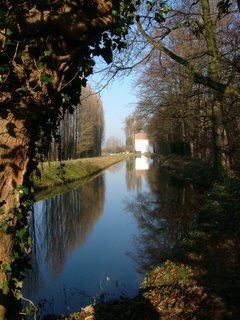 The mill itself operates on the first and third Sunday of every month (subject to the water level), and is open to the public who can view the mill workings, and buy the oatmeal and wholegrain flour produced there. Saturday’s visit to the winter gardens at Anglesey Abbey saw me buying up armsful of flour bags and quizzing the miller in enormous detail, all to keep you happy. There has been a mill on this site since the Domesday survey, but the current mill is only about 300 years old. The building has four storeys; a ground floor; a stone floor where the mill stones are kept and operated; and two upper storage floors. 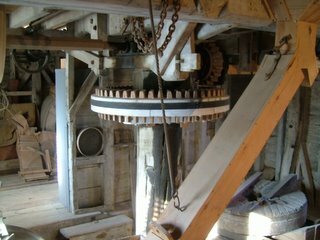 This huge central shaft (the wheel you can see here is the spur wheel which drives the gears under the mill stone) is made from a whole sweet chestnut trunk; other wood in the mill building and wheels is seasoned oak, which, according to the miller, is as hard as iron. There are four pairs of stones, each of which has to be dressed (cut with chisels) every ten uses to keep them sharp for grinding. The resulting flour is pushed from the outside edge of the mill stones and falls down a chute to the ground floor. It takes 30 seconds and ten tons of water to make 1 ½ kilograms of flour. Half an hour before you start, put the flour in a warm place. Dissolve the yeast and honey in half the water. 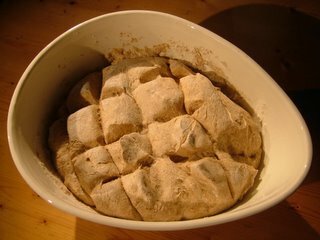 Put the warm flour in a large bowl with the salt and make a well in the centre. Pour all the yeast and honey mixture into the well, and mix with your hand until it’s all soaked into the flour. Add the rest of the tepid water and continue mixing until you have a soft dough. Knead for ten minutes to develop the gluten in the dough; you should end up with a soft, stretchy mass. Return it to its bowl. Flour the top of the dough and use scissors to score it; this will help it to prove faster. Leave it somewhere warm until it has doubled in size (an hour or so in a warm room), then knock all the air out of it, kneading for a couple of minutes. 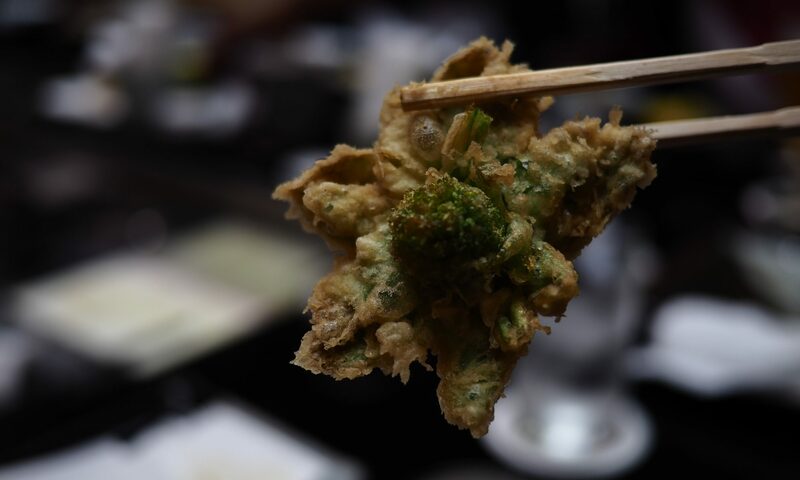 Divide the dough into six pieces, and form them into balls. Arrange the balls in a cake tin, flour them and leave the tin in a warm place again until the bread dough has doubled in size once more. This flour makes a lovely, malty bread. Enjoy it toasted with honey, and bask in the smell filling your house. Hi Squeezeweasel, I got here via Kalyn’s site – I couldn’t help visiting as I live in Bury St Edmunds 🙂 I’d love to visit this mill, it looks great and your pictures are absolutely beautiful (and your bread looks perfect of course!). OMG your post made me miss England so much, especially the first picture. The bread looks so delicious too! could you directly substitute spelt flour do you think? I don’t see why not, although I’ve not tried it in a mix with white flour. You’d end up with a sweeter loaf – but that’s quite nice, especially with honey. What a great post—we have an old mill in town (Salt Lake City) that’s still operational as well. They make fantastic grain flour for bread companies in San Francisco. But they’ve expanded to a modern facility as well to keep up with demand. And I’ve always had success using their product. Your post reminded me of how lucky it is to have one around. WOW!! How furtuante for us that you were able to go visit such a palce. Its wonderful to know that these old milner’s are still around. thanks for sharing this recipe- it’s fantastically hearty. 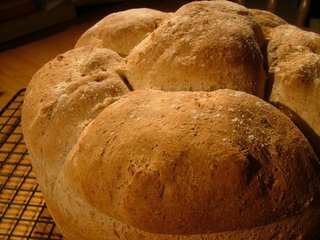 I bought some lode mill flour and was given a recipe for the bread using a bread maker. I cannot find the recipe now has anyone got one for this wheat flour. Lode Mill is open every day now. From 11am to 3.30pm. Lode Mill is now open every day. Sorry – the Lode Mill is closed on Mondays and Tuesdays but open Wednesday to Sunday and we mill every day as long as there are at least a couple of millers present, which is most days, especially from March to October. Well worth coming to see and you can watch your delicious organic flour being stone-ground and bagged! Makes good pizzas and chapattis too! I just found your mill, would love to buy the fresh flour from you to make bread in my home for my family, I live in Southern California …… Do let me know were I can order it from you.